» Episode Guide » Viewing Episode: 目指せカロスクイーン！ セレナ、デビューです！！/Aim to Become Kalos Queen! Serena's Grand Debut!! 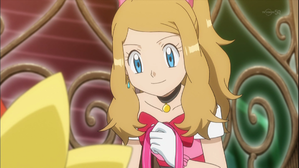 Satoshi and Serena's First Date!? The Vow Tree and the Presents!! Into the Badlands! Fight, Numera! !